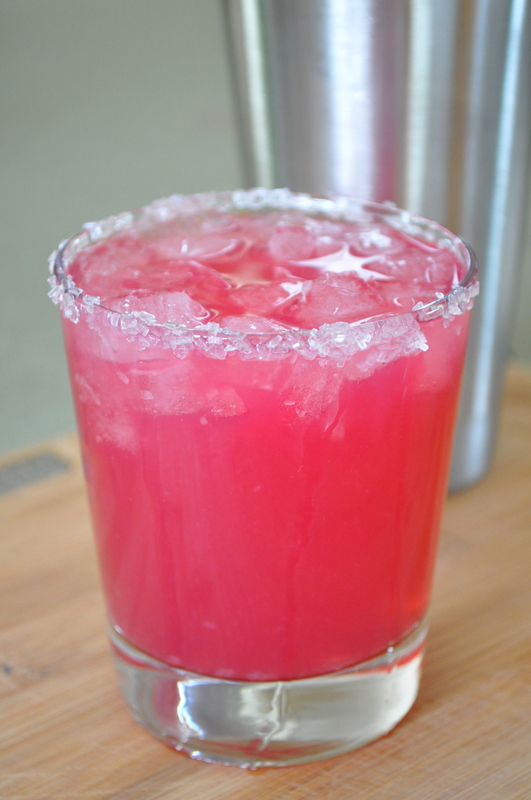 Prickly Pear Margaritas – From Scratch! Posted by sarahsjoys in Drinks, Sauces, Jams, etc. I first discovered the prickly pear fruit when I was living in Arizona. I had two friends who shared my love of cooking. We’ll call them Paul and Heather, mainly because those are, in fact, their names. We inadvertently formed a kind of dinner club. The host for the week was responsible for the main course, someone else would bring bread or salad, the 3rd would bring wine, and we rotated weekly. One epic meal will stand out forever. We decided to embrace our current location of the great southwest and cook an entire meal of cacti. We stocked up on nopale leaves and de-stickered them ourselves. We made slow-cooking beef machaca from scratch, stuffed the machaca inside nopale leaves, and roasted. Nopale leaves were also cut into strips, dipped in batter, fried, and drizzled with saguaro honey. But the part that required extra planning was the prickly pear margaritas. Prickly pears were soaked in tequila for 72 hours. Then it was all put in the blender, strained through a sieve and the prickly pear-tequila puree was used to make the margaritas. The meal was a ton of fun and considered a rousing success. However….despite subsequent attempts at making the margaritas, I was never totally happy with them. 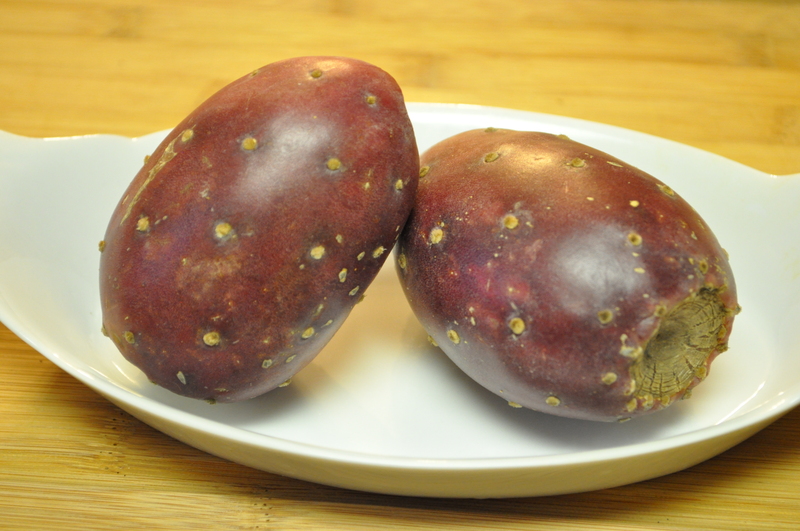 Prickly pears have a light, sweet, almost floral taste. The flavor was totally drowned out in the recipe I was using. I tried different tequila to fruit ratios but they never seemed quite right. I even found “prickly pear” syrup offered in a store in Sedona and thought I would give that a try but it turned out to be little more than simple syrup with fuschia food coloring. Remember that produce purchasing problem I discussed in my last post? Well, just yesterday I saw the most gorgeous prickly pears and knew what my next venture would be. 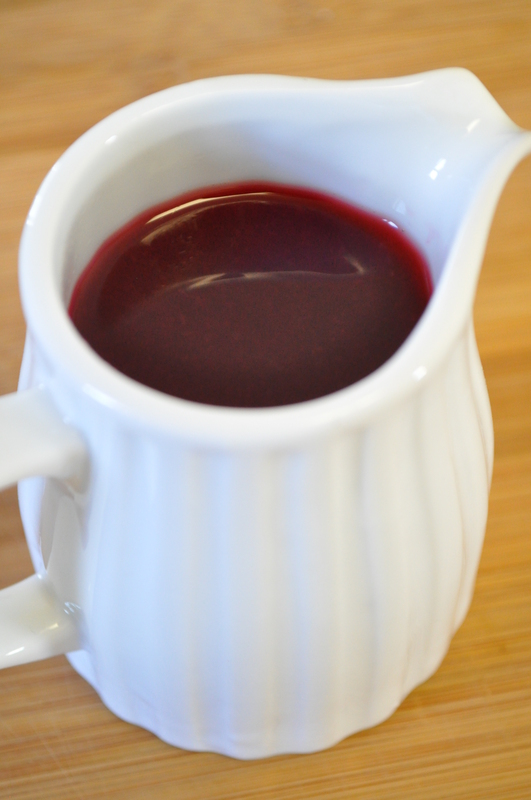 I would make my OWN prickly pear syrup from scratch! That’s just what I did. 1. Slice through the prickly pear skin and remove the fruit. Roughly chop. Isn’t it a gorgeous color? Here you can see how thick the skin is. 2. Place the fruit in a small saucepan with water and sugar over medium heat. Simmer for 10-15 minutes until the fruit is softened and broken down. This is why I used more water than a regular simple syrup recipe. I didn’t want it to get too thick while simmering to soften the fruit. 3. Place a sieve over a bowl and pour the prickly pear mixture into the sieve. Use the back of a spoon to push the softened fruit through the sieve, leaving behind the large seeds. This recipe yields about 2 cups of prickly pear syrup. Combine the tequila, triple sec, lime juice and pear syrup in a cocktail shaker with ice. Shake vigorously to incorporate. Dip rim of glass in lime juice and then into the sugar crystals to coat the rim. Fill glass halfway with ice. Then pour margarita into glass and serve. This one is for Paul and Heather who were there in the early days of my food adventures…Salud! Salud indeed! Do you like the stronger bite of the blanca or plata (silver) tequila? I should note that there *is* one decent bottle of Cuervo, which is their Cuervo Tradicional. I prefer the gold, but there is a plata or blanca option. 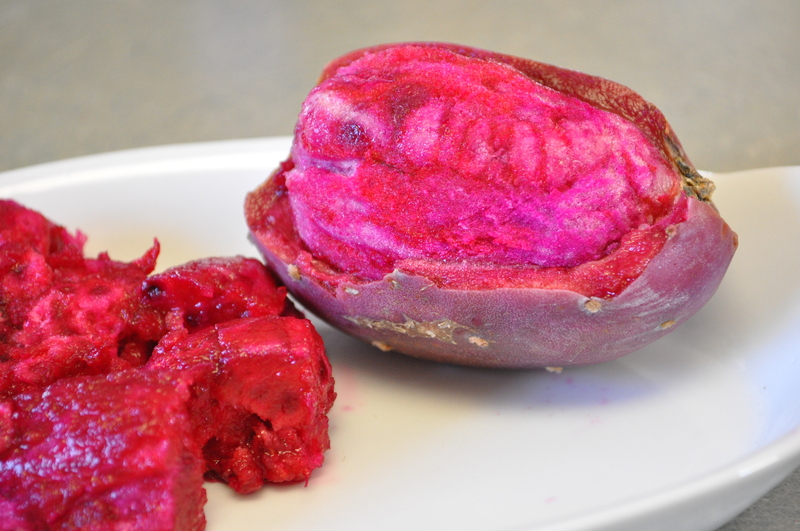 I’m gonna have to look for prickly pear fruit this week – these look like incredible drinks. I still remember that meal as well. Good food & good friends is an unbeatable combination! Emeril’s recipe called for the blanca. I wasn’t sure if that was really for the flavor profile or because a gold tequila might interfere somewhat with the pretty color? The tequila I had on hand was Cuervo…and I decided that was not an option! 🙂 When you try them out, let me know what tequila you used and how you liked it! I love the color! I will have to give these a try when I can get my hands on some prickly pears. Thank you!! We LOVE them! I am trying the hibiscus margaritas tomorrow with a friend. Have you ever used powdered hibiscus? Any idea how much I should use? I suppose I can just do it by taste…just thought I’d see if you have any experience with it? Hi! I live in Pennsylvania (Northeast PA), and after reading through your amazing recipes and colorful pictures, I’m interested in giving the prickly pears a try (the syrup looks amazing & I’d love to try my hand at a jelly). I was wondering if you have any knowledge of where I could order these fruits (by the pound/case/etc.) for home delivery? I’ve searched online, but all I can find are pre-made drinks (nopalea juice) or concentrated powders. Any info would be greatly appreciated. Thank you, and happy cooking! 1) Look for bruises. Tuna are extremely soft and bruise even during the picking process. Seeing bruises is okay, but it’s the amount and the severity that should be checked. The Tuna should be a beautiful magenta shade, bruises are easy to spot being a rich purple. If more than half of the fruit is bruised, or the bruises are severely dented or squishy, look elsewhere. 2)Skin should be intact. If there are large cuts(as with any fresh produce) be wary, also if the skin is torn away(in a fingernail or more sized piece) from the tapered base this means either the picker was careless, or the fruit wasn’t quite ready yet. 3) When handling, never EVER handle without gloves(leather or working gloves, not medical) unless you wish to be spending days hunting for the infamous near-invisible barbs of the Prickly Pear. If you don’t have access to gloves, pick up gently, using the lightest pressure possible, and stay away from the white “spots” you will see. It may not look like it, but each spot has hundreds of minuscule thorns that take perfect lighting, high magnification, tweezers, and duct tape to remove. I have been collecting Tuna since I was a child, using the native broom weed to dust before picking and thus removing a large number of the thorns. I know for a fact that Arizona, New Mexico and probably parts of southern Texas have Prickly Pear in abundance and that they ripen in the early fall(August and September). If you can’t find PP syrup online, you may look for the unsweetened juice( which is how I process and freeze my hauls). If that is unsuccessful, then maybe a family trip is in order :). Good luck, I hope my segment helps you. I forgot how much prettier your prickly pear margaritas are than mine! Thanks! I haven’t made them in sooooo long. I need to give your version a try some time too! First things first though….unpack glassware. Sarah, I literally googled “prickly pear margarita recipe” in search of one that showed how to make the prickly pear syrup from scratch. Yours came up. Funny story – my name is Sarah Joy. I’m about to “retire” from teaching at an international school. Anyway, love the blog, can’t wait to try the recipe! That’s too funny that we have so much in common! Thanks for saying ‘hi!’ I hope you enjoy it. I haven’t made it in a long time. I should make some this summer. Enjoy your ‘retirement’!